The Compulsive Reader: Perfect Reading Accessories! While at Book Blogger Convention in May, I discovered Lightwedge, a source for reading accessories of all kinds, for print or e-reading. 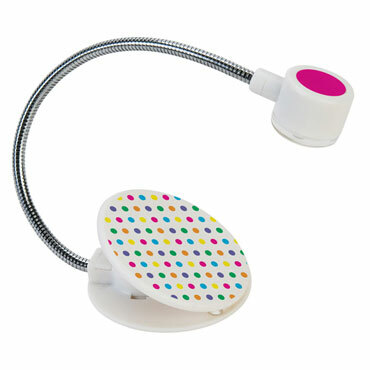 They have accessories for lots of different devices, and some really cool book lights. I picked up this cool little book light at the convention, and I like it a lot because it's super lightweight, it clips easily on to my paperback, hardcover, or Kindle (without scratching it! ), and the light isn't too bright for my Kindle screen. I've taken it with me on a few flights (I always seem to have a seat partner who gets annoyed when I want to turn my light on, and anyway, that light is really weak in a dark plane) and it's just so handy. Lightwedge has a LOT of different lights and other cool things as well, and I am in love with these book lights right here, which come in all sorts of designs (and they're not just girly, so guys can find one they like too). And the cool thing about these ones? They roll up and snap into the clip so you can store it easily. Plus, it's only $10! 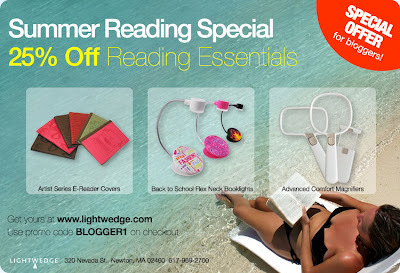 Lightwedge is running a deal for bloggers and their readers now...so check out the website and see what you can get 25% off! I can't recommend their book lights enough. I have never had one that is so versatile and convenient...I just love it! Those lights are so cute! I love them.